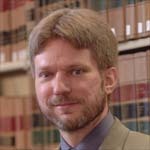 Brian Huddleston has worked at the Loyola University New Orleans College of Law library since 1999 and is now the Senior Reference Librarian there. He is the author of nine CALI lessons on legal research and served on the CALI Legal Research Community Authoring Project Advisory Panel for two years. Brian earned his undergraduate degree from Excelsior College while on active duty in the Marine Corps, then received his J.D. from the University of Alabama School of Law and his M.L.I.S. from the University of Washington Information School's Law Librarianship Program.